Some visit the Gokyo Lakes as part of the Everest Base Camp tours but Driftwood Adventure prefers to visit the Gokyo Lakes as a stand-alone trip. Find out why the Everest Gokyo lake trek is an amazing destination of its own. The sparkling, pristine blue and green waters of the Gokyo Lakes are one of Nepal’s most memorable sights. They are a series of six spectacular lakes. The lakes are situated at altitudes of between 4,700m and 5000m, making them some of the world’s highest freshwater lakes. The Gokyo Lakes are situated in the beautiful Sagarmatha National Park, which is also the home to Mount Everest. The Gokyo Lakes trek starts in Kathmandu. We will meet there to enjoy a city tour before flying out to Lukla. 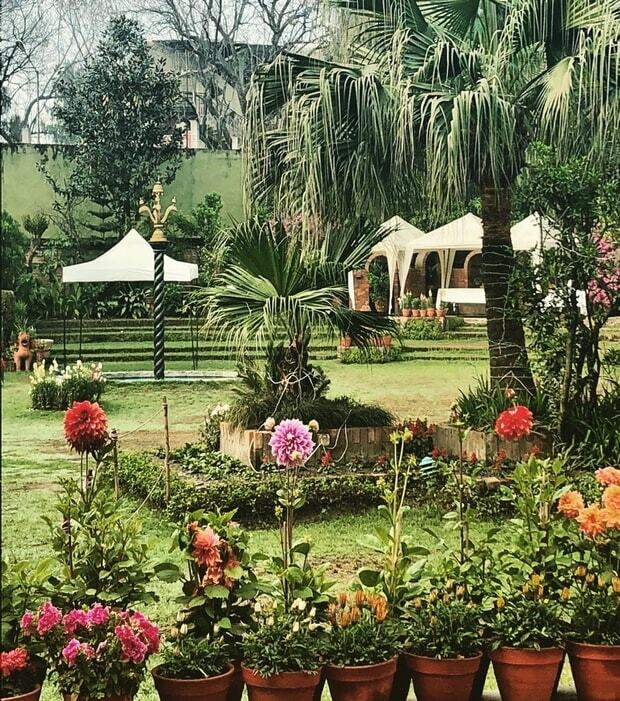 We spend 2 days in Kathmandu in a beautiful local hotel surrounded by peaceful gardens. Enjoy getting to know your group as you visit many World Heritage sites and get ready for your trek. Your adventure starts with the flight. The scenery during the flights is spectacular. You truly get a bird’s eye view of the mountains as we fly into the Lukla airport. The airport is set into the side of a mountain, therefore there is pretty much no descent. The ‘runway’ is more of a driveway with a slight incline, unlike any other flight experience. Our Sherpas and porters will be right at the airport to welcome us to the Khumbu Valley, one of the best regions in the world to travel. We will start our trek off at our Sherpas house where we will be welcomed with true Nepalese foods and traditions as we acclimate to the altitude of the Himalayas. We make sure to schedule in extra rest days, so you can acclimate to the altitude. You also have fewer nights spent at very high altitude. Where do we sleep? We stay in tea houses along the way. The teahouses vary slightly, but most are simple stone and wooden buildings that have a kitchen, a communal eating room and bathroom area. There are a number of basic bedrooms that usually have two single beds and a table. These traditional establishments not only provide you with a convenient watering hole and a place to lay your head; it is also a great way to get to know Nepalese culture. The best part of teahouse trekking is being greeted by a warm smile of a new friend. It feels as if you are invited into their homes for a rest, to get warm, and yes have a cup of tea. Lemon tea is often the favorite. Tea houses are a place where you can sit around a pot belly stove, meet and chat with other trekkers, play cards or share stories of your experiences. When you choose to trek with Driftwood Adventure you will find yourself in a smaller more intimate group setting. This allows us to focus on each individual, making it a trip of a lifetime. There are opportunities to volunteer in local schools, learn to cook traditional Sherpa stew and momos and participate in photography workshops focusing on landscapes and portraiture. What is the trek like? The Gokyo Lakes is ideal for experienced hikers who want to trek in the Everest region, but who want more variety of views and fewer nights spent at very high altitude. The Gokyo Lakes route is still fairly quiet, which means you can often walk a couple of hours without seeing other people. The traditional Everest Base Camp route can be pretty crowded. Although it’s great to meet people from all over the world as you trek – it can also take away from the trekking experience and surrounding ambience. The Gokyo Lakes trekking route leads hikers through some incredible views and landscapes as they climb Gokyo Ri and cross the ChoLa Pass. Gokyo Ri overlooks the small village Gokyo. 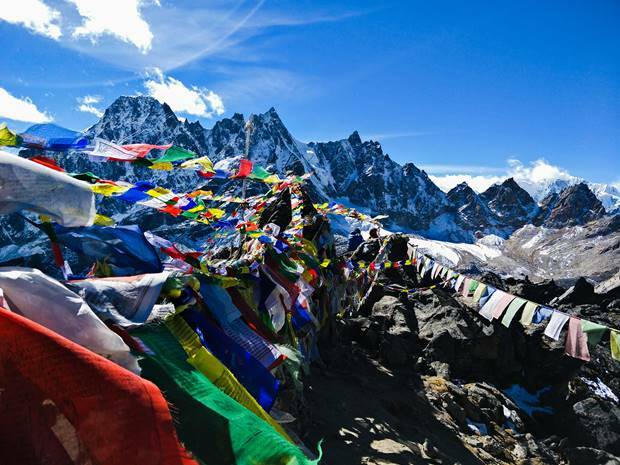 This climb offers some of the most incredible views of Mt Everest and Cho Oyu you will find. The views are arguably even better than Kalapathar, which is the most popular viewpoint along the traditional Everest Base Camp Tours trek route. The ChoLa Pass is between two small villages; Dragnak to the west and Dzongla (about 17,000 ft). You will find yourself surrounded by dramatic landscapes and towering snowy Himalayan peaks like Thamserku, Kangtega, Cho-Oyu, Pumori, Nuptse, Lhotse as well as Everest. 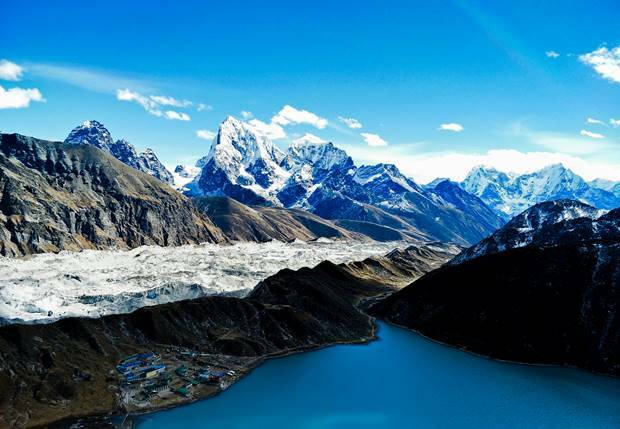 Imagine yourself standing at the shores of a chain of six turquoise, glacial-fed lakes, trekking along the Ngozumpa Glacier, the largest glacier in the Himalayas, photographing Everest, Lhitse and Cho Oyu from Gokyo RI, (5357m, 17,500ft), and exploring the Sherpa towns of Khumjung and Namche Bazaar. Driftwood Adventure Treks will be heading to the Gokyo Lakes Nov 4-17, 2018. As an early bird special we are offering 20% off any of our upcoming trips until the end of May.